As one the dreadlords overseeing the Legion's forces during the Third War, Varimathras failed to stop the rebellious Lich King. He submitted to an ill-fated alliance with Sylvanas Windrunner, then made one last bid for power before facing a humiliating defeat. In payment for his blunders, Varimathras has been tortured by the Coven of Shivarra. The vindictive sisters stripped away both flesh and sanity, leaving only a singular desire to inflict suffering upon the mortals who cost him everything. Varimathras is in a prison platform with the Shivarras (the other bosses in this raid) on the platform above. They torture Varimathras by doing dmg on his platform. Since you will be on his platform attacking him, you will take the same damage. This damage is debuffs that changes during the fight that does fire, frost (also slows), fel or shadow dmg. You will fight boss only and this fight is one big phase. 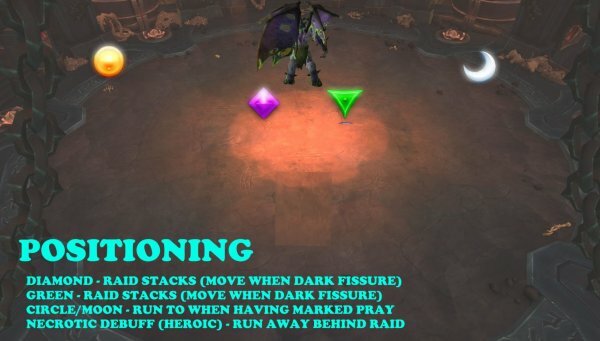 This is a typical standard boss fight in which you have to stack on raid and move when boss does abilities on you or other raid members. 1) Boss does only shadow damage abilities, and taking shadow damage gives you a debuff called misery. This debuff prevents all healing taken for 7s and increase physical dmg taken by 200%. 2) If you are not within 8 yards to anyone else, you will take shadow dmg when boss does alone in the darkness. The best way is to stack behind boss (on the side) and move as one to the other side behind boss, when a pool is under the raid (Dark fissure). 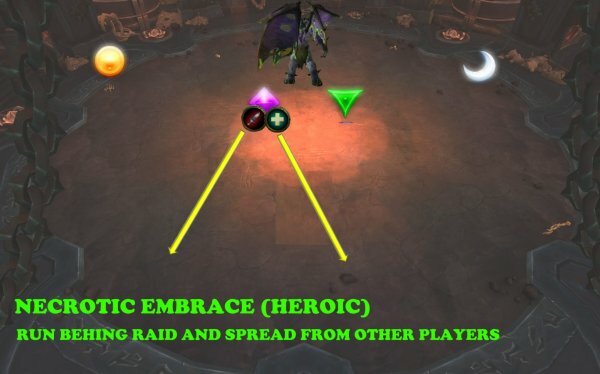 When boss puts a necrotic dmg debuff (heroic mode), you run behind raid before it expires, otherwise it will spread to close players. When boss targets you to charge you (marked pray), you run to the side of boss and get charged there. Healers must beware to top up players with misery debuff when it has expired (after 7 sec). Make sure that you know who got the debuff, otherwise you will heal players with debuff which is meaningless, and you will waste a lot of mana, since at least one player will have that debuff during the entire fight. Tanks must be 8 yards to each other as well when boss does alone in the dark, otherwise, both will take shadow damage which leads to a misery debuff. And since this is the tank swap debuff, it will cause big problems. Make sure that off tank is on top of boss but behind the swipe boss does on main tank. Make sure that main tank is as close as possible to boss without turning him to any other direction. In this way tanks will be close to each other. Tank boss on the upper side of the platform. Turn boss away from raid,. Off tank – stand close behind boss (within 8 yards of main tank). Have one marker on right side behind boss. 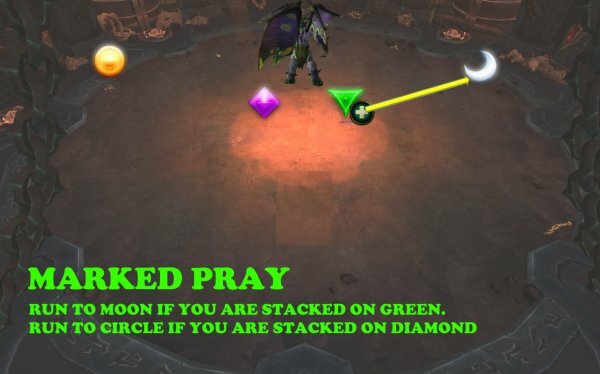 Raid stacks on one of the markers each time. Any player getting hit by shadow damage (which is more or less the major type of dmg in this fight), will get a debuff called Misery. This debuff lasts for 7 seconds. This debuff makes you immune to all healing effects. This debuff increase the physical damage taken by 200%. This is something players need to master the entire fight. This will be the tank swap debuff since tanks cannot avoid getting hit by the boss ability Shadow Strike. Tanks swap at every Shadow Strike, meaning, tank swap whenever you get a misery debuff. This will happen every 10 sec, so there will be plenty of tank swapping in this fight. When tanks, and other players take shadow damage, they cannot be healed for 7 sec. Don’t waste healing them until they can be healed since at least one player will have this debuff during the entire fight. You don’t want to go oom because of this. Also, make sure to top up the health of players when misery debuff has expired. Boss will do high Shadow damage to any player that is not within 8 yards of another player. Will always be stacked behind boss on the left or right side (see positioning). Players will run away from raid from time to time because of other abilities, but must run back fast after those abilities are done. The off tank must stand close to main tank, always. 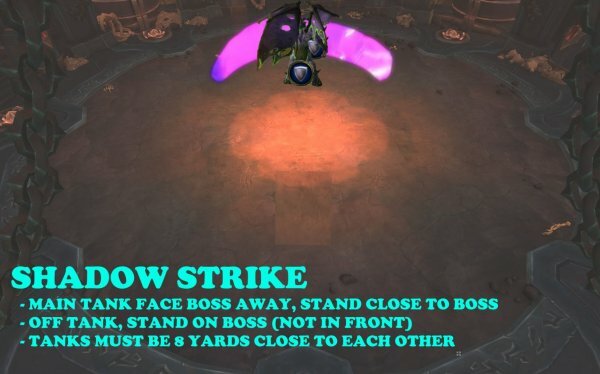 Stand under boss and make sure you don’t get hit by the Shadow strike boss does on main tank. This is a frontal cone high shadow damage. Boss does this every 10 second. Only one tank in front of boss. Other tank with raid behind boss. ALWAYS taunt off when you are in front of boss in case so that the next shadow strike doesn’t hit the raid. Boss puts a pool under 3 targeted players. This pool does high shadow damage for 6 seconds. After 6 sec, it does very high shadow dmg to all players within it radius. Have two markers behind boss, one on the left side and one on the right side behind boss. Entire raid stack on left side behind boss at pull. When dark fissure pools are on the ground, entire raid moves to the right side behind boss. 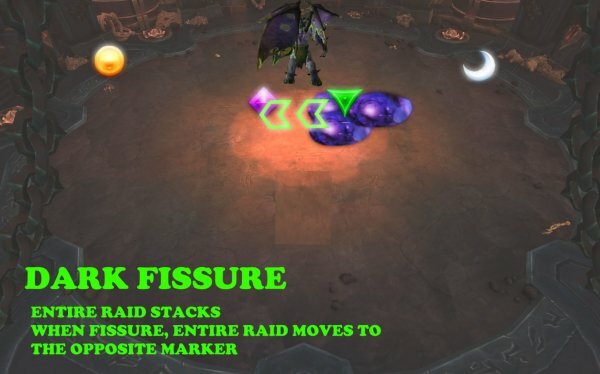 Next dark fissure, raid moves back to left side behind boss. Boss puts a debuff on 2 or more players depending on raid size. After 4 sec, the debuff expires and does high Shadow damage to that player. If other players are within 10 yards of that player when it expires, they will also get the same debuff. Targeted players run far behind raid and spread from each other. Wait for debuff to expire, then run back and stack with raid again. Boss will target a player. After 5 sec, he will charge that player. The first target in the way of the charge will take high Shadow damage and a knock back. Targeted player runs far to the left side of boss if the stacked raid is on the left side behind boss. Targeted player runs far to the right side of boss if the stacked raid is on the right side behind boss. No other player should stand on the side of boss. There will be an arrow on the ground showing the direction of the charge. 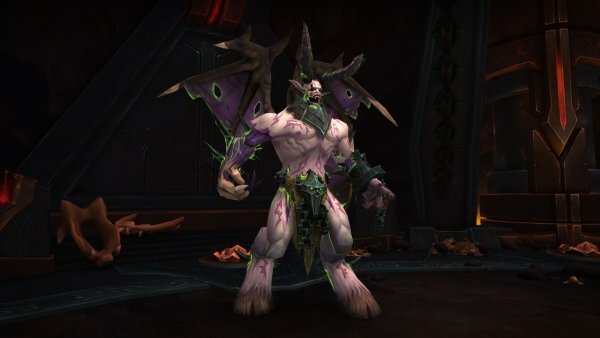 During the entire fight there will be fire, frost, fel or shadow damage on the entire platform. Flames fill the platform and does Fire damage to all players ever second. Cold Air fills the platform, does Frost damage to all players ever second, and reduces movement speed by 40%. Fel fills the platform and does Fel damage to all players ever second. The damage increases for each second. Dark magic fills the platform and does Shadow damage to all players ever second.